Can we have a world free of cluster bombs? We are on our way. 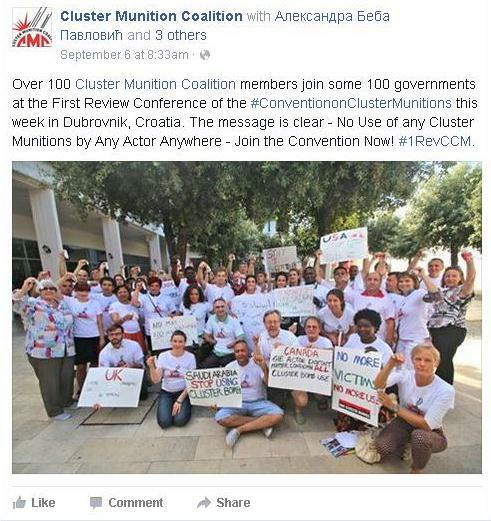 Close to 100 countries, closely accosted by over 100 civil society campaigners mainly under the umbrella of the Cluster Munitions Coalition (CMC), converged on Dubrovnik, Croatia from 7-11 September 2015 on the occasion of the First Review(1RC) of the Convention on Cluster Munitions(CCM). The convention entered into force five years ago. In its short yet robust life, the CCM has been a heralded success, with over 70% of cluster munitions held in the world’s stockpiles having been destroyed. Clearance of contaminated lands in affected countries and regions is also going on steadily. These achievements have been tempered with some sobering new statistics. The closing press release highlighted both the life-saving successes of the treaty in its first five years, as well as “serious concerns over new use of the weapon in Libya, Sudan, Syria Ukraine and Yemen during the past year and the alarming number of new civilian casualties, “ citing the Cluster Munitions Monitor 2015 report that documents nearly 2,000 cluster munition casualties in Syria alone since 2012. Civilians continued to suffer the most harm among known cluster munition casualties, comprising 92% according to the Monitor report. Horrifically, half of those killed and injured were children. Nearly 100 Countries have joined the CCM as States Parties and many more are completing requisite administrative processes in their capitals that will make them States Parties before long. Mozambique announced completion of its obligations under the CCM making it a cluster munition (and landmine) free country well ahead of its deadline as mandated by the Convention. I represented IPPNW at the 1RC and coordinated African campaigners during the eventful week, during which we worked round the clock lobbying diplomats to make further progress on all the relevant CCM provisions. IPPNW has been a crucial cog in the CMC by serving on its Governance Board via IPPNW Zambia and IPPNW Russia. We will continue in this role as we work with CMC colleagues to call for a world-free of these destructive munitions that wreak so much havoc and suffering. The key message at 1RC revolved around full universality of the CCM and highlighting those areas that illustrated that working with civil society organisations can bring about real impact on the ground. Lives and limbs have been saved and hitherto contaminated land has been returned to agricultural and other commercial use. Survivors and victims of cluster munitions were an important part of the CMC delegation. They told moving accounts of their respective encounters with cluster munitions. Not a few diplomats were seen shedding tears at the recounting of cluster munition incidents. The 1RC also provided a time to look forward. In this regard a Dubrovnik Political Declaration by Ministers who spoke during the high-level segment of 1RC was crafted in addition to the Dubrovnik Action Plan (DAP) which is a working document to guide the work until the Second Review Conference. The Conference Outcome Document was unanimously adopted by acclamation with a few countries notably the Kingdom of Norway and the UK expressing some guarded reservations of some inconsequential clauses. The Kingdom of the Netherlands offered to be President of the 6th Meeting of States Parties to the CCM.